Well, why not? We live in an age of easy access to remarkable technologies, and if the consumer market has space for a full motion driving simulator, then someone will certainly provide such a thing. I’m all for it. In fact, if I had the means, I would surely add it to my own shopping cart. But I must say that seeing this advertisement brings to mind a subtle aspect of simulator technology, and the accompanying question: Can driving simulators be commoditized? The quick answer is “Yes, of course. Just see the ad.” But if we pause for a moment, we might have a suspicion that there is a bit more to it. As we’ve previously discussed in our article about the 3 main types of driving simulators, there is a broad spectrum of Human-in-the-Loop simulators in use in the automotive world today – ranging from gaming-oriented devices to the engineering-class simulators used by vehicle manufacturers to develop their products. In fact, the range of types (and costs) can be staggering. If one searches for driving simulators anywhere in this broad gaming-to-engineering range, one will find “commodity” offerings, one-size-fits-all simulators that are purported to do it all. While such simulators are easy to specify, in a catalogue sense, they are very likely aimed at serving a particular purpose. For example, they might have been designed to perform certain tasks very well. On the gaming end of the range, this is rather benign since the buyer probably has a role for in mind from the onset (competitive gaming, pay-per-ride entertainment attraction, etc. ), and the simulator will, more than likely, be able to live up to expectations. On the engineering end of the range, “catalogue simulators” can limit the possibilities for performance, interconnectivity, and future development – so it behooves the buyer to consider the case more carefully. One approach for vehicle manufacturers is to “do it yourself,” to design and build a driving simulator in-house. This approach usually produces a useful tool, but there is a known opportunity cost: The energy consumed in designing, operating, and maintaining the simulator could be applied to the core task of vehicle design and development, e.g., a carpenter may not wish to design and build his own hammer. Another approach is to source a driving simulator that is scalable and modular, rather than a closed commodity. If we are interested in driving simulator technology for its potential to assist with particular areas of vehicle development or driver assessment, we might be interested in certain types of simulators, but not others. A practical approach to buying a driving simulator is centered on the identification of use cases and the assessment of various simulators’ capability to satisfy them. 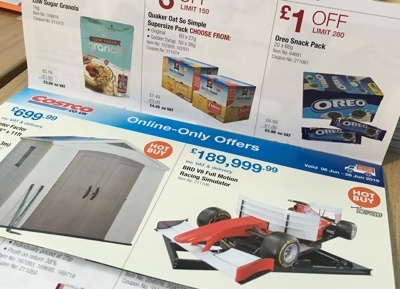 If I am an aspiring race driver, and I would like to have the experience of driving a formula car on all the world’s most famous race tracks without actually travelling to all of them, I might go to Costco. If I am a vehicle manufacturer and I need to know how a stability control system from Supplier X is going to influence my core chassis development program, I am going to go shopping for engineering-class simulators from suppliers such as Ansible Motion. Ultimately it is a matter of finding and acquiring the right tool for the job at hand. Do you have a simulation challenge or unique use case that you would like to discuss? Schedule a discussion with one of Ansible Motion’s experts.